Korg was doing well with the workstation synths after the release of M1 in 1988. 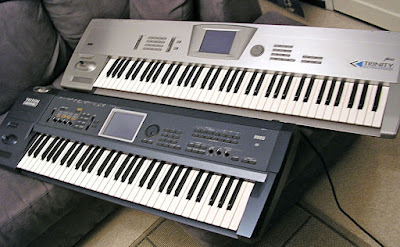 But they really took the workstation concept further with the state-of-the-art Korg Trinity in 1995. I was happily playing my 01/W until I tried the new Trinity which totally blew me away! The sound was so clear with it's 48kHz samples, there are multi-mode filters with resonance (finally in a Korg workstation synth!) and the large touch-view screen was such hi-tech at the time and very convenient to use. Trinity also looks gorgeous with it's simple but stylish design. So it was about time to sell my first synth, the 01/W, and get a Trinity instead. Allright, but first in the 90's Korg released the Trinity as a PCM-sample based synth workstation, and it was a very capable one. 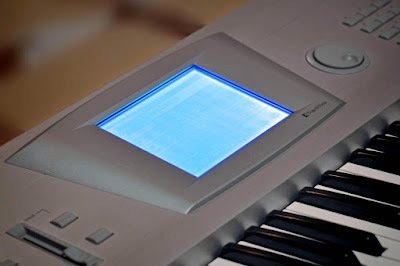 The sequencer was powerful and easy to use with the touch sensitive screen, and I produced music many years with it being my main sequencer. 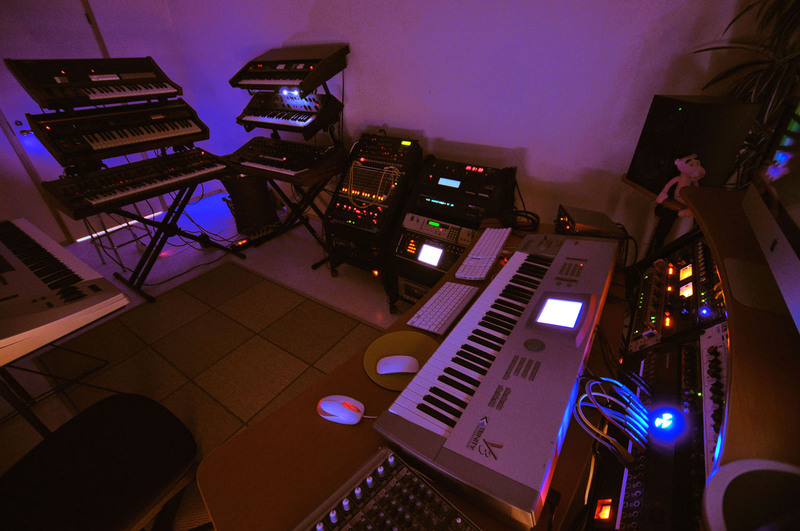 The effects section was very big improvement over the ones seen in previous Korg workstations. 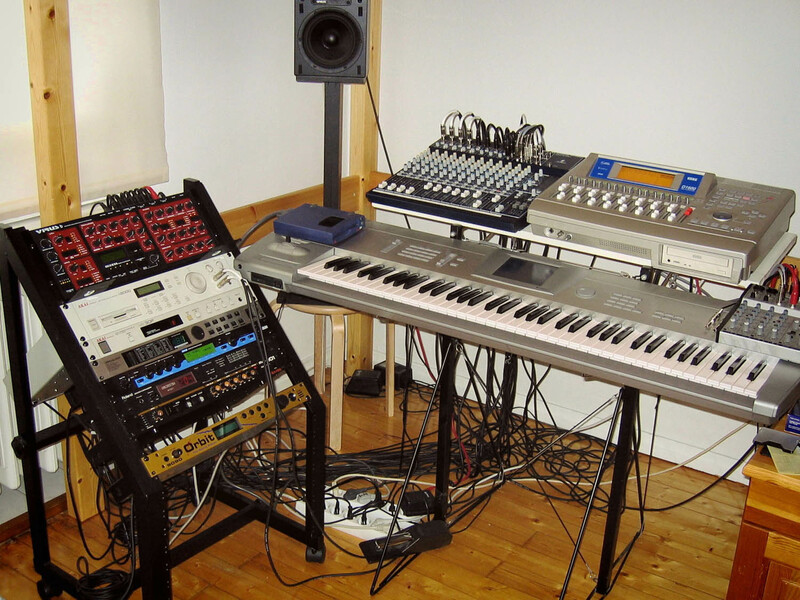 It had flexible routings and the effects could be sent individually to different sounds, just like it should. And the amount of simultaneous effects was much greater with separate master and insert effects. The Trinity still didn't have knobs for realtime tweaking, but the ribbon controller is actually making up for some of that. It's also pretty easy to program with that big touch-screen. 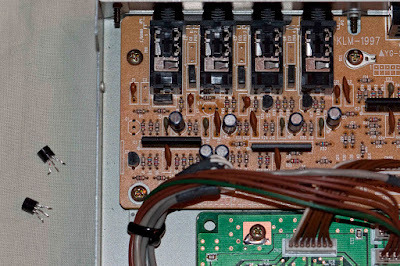 To keep the price tag reasonable Korg made the Trinity upgradeable. 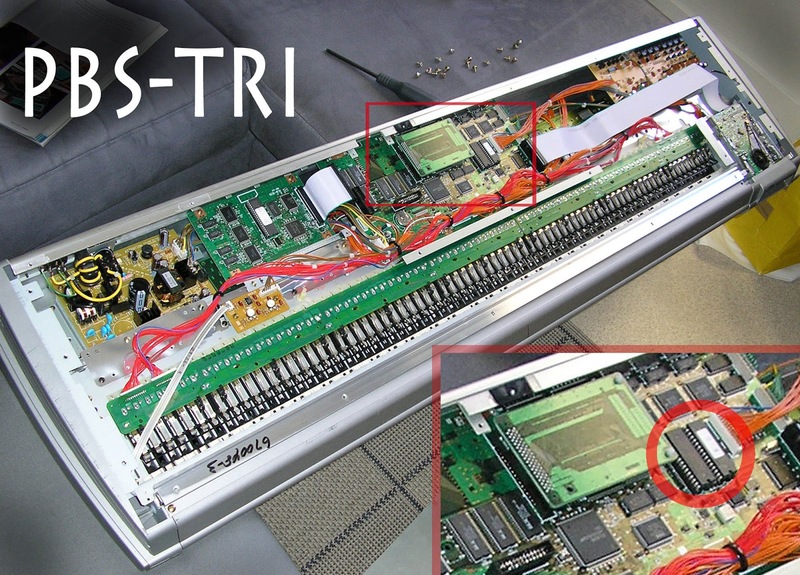 There were many optional hardware kits like the SOLO-TRI board that I soon installed to my unit. 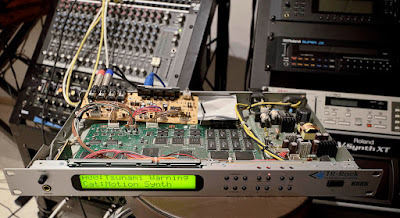 The SOLO-TRI is MOSS-based (Multi Oscillator Synthesis System) monosynth, the same engine that's in the Prophecy synth. I was most happy having that inside my Trinity, as I was used to only sample based synthesis before that. 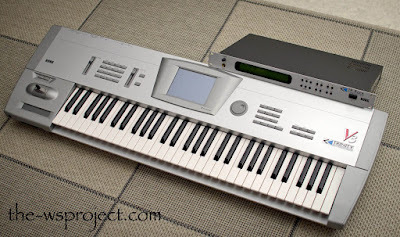 The SOLO-TRI was kind of my first "real synthesizer". Korg sold these also factory installed under the name Trinity plus. My current Trinity is a V3 which refers to it's operating system number. 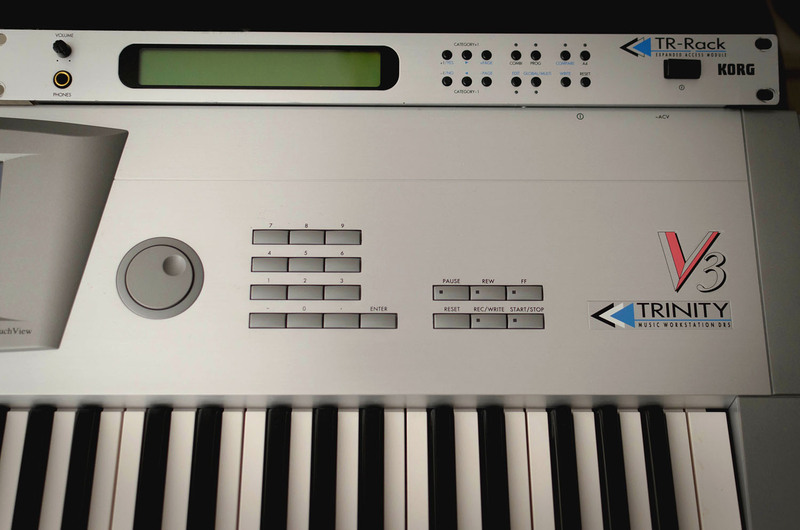 But the V3's are fitted with MOSS-TRI, that's similar to SOLO-TRI but it's six voice polyphonic (based on the fantastic Korg Z1 synth). MOSS-TRI has some other differences with the SOLO-TRI too, like additional oscillator types, but the sound has a somewhat same character. 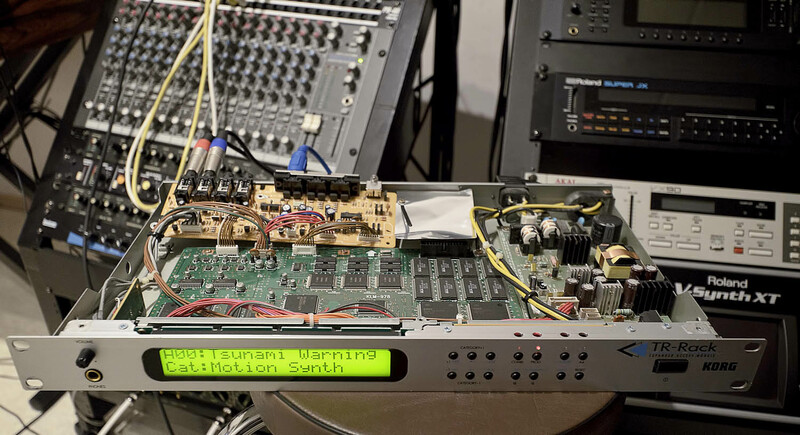 This original MOSS technology is highly acclaimed for it's good sound and infinite sound pallette. Any Trinity can be fitted with either the SOLO-TRI or the MOSS-TRI but not both of them simultaneously. 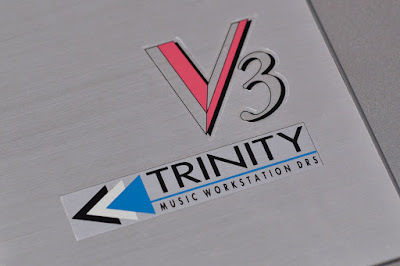 Other options for Trinity are the SCSI-TRI and DI-TRI (ADAT I/O) for added connectivity and the HDR-TRI for internal hard disk recording. For me in a modern studio environment I only need the options that makes Trinity a better synth, that is either SOLO-TRI or MOSS-TRI with PBS-TRI. 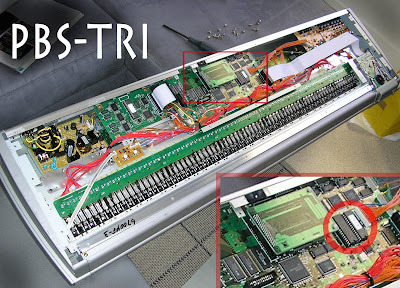 PBS-TRI option and the two ram-chips inside the Trinity. 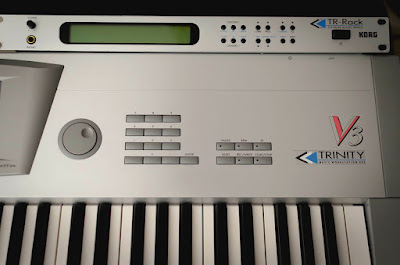 I also previously had a Trinity Pro (76-key model) that had prefitted solo-synth and sample-options. Before selling it I decided to keep the PBS-TRI (and I'm happy I did, because I later installed it to my V3). But I made the typical mistake when uninstalling the PBS-TRI - I left the two ram chips inside! So I didn't realize the complete PBS-TRI consists of the board AND these two chips... Fortunately there was a discussion about this in the korgforums.com. What I did was that I got two similar 3rd party chips from ebay (they're cheap). Wasn't sure if they're going to work or not until I finally got the Trinity V3. Then I installed the board with these chips, performed the system reset (enter+0 while powering on) and it all works just fine! My old Trinity Pro long time ago. I replaced my Trinity with a Triton Extreme, but later got rid of the Triton and got a Trinity back. Trinity has been my master keyboard many times. 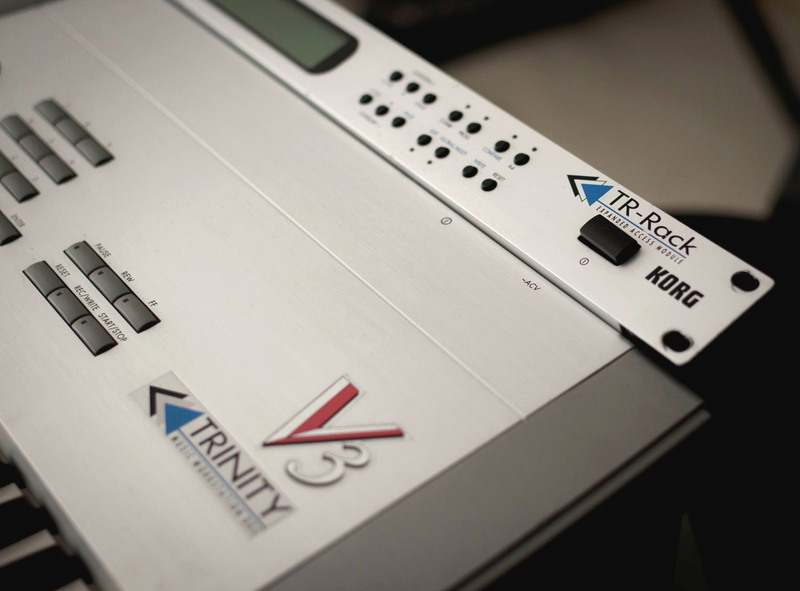 The TR-Rack is basically the Trinity in 1 unit rack module. It uses only the ACCESS -sample based sound engine (no MOSS-options), but it adds 8 MBytes more sample ROM over the workstation model. 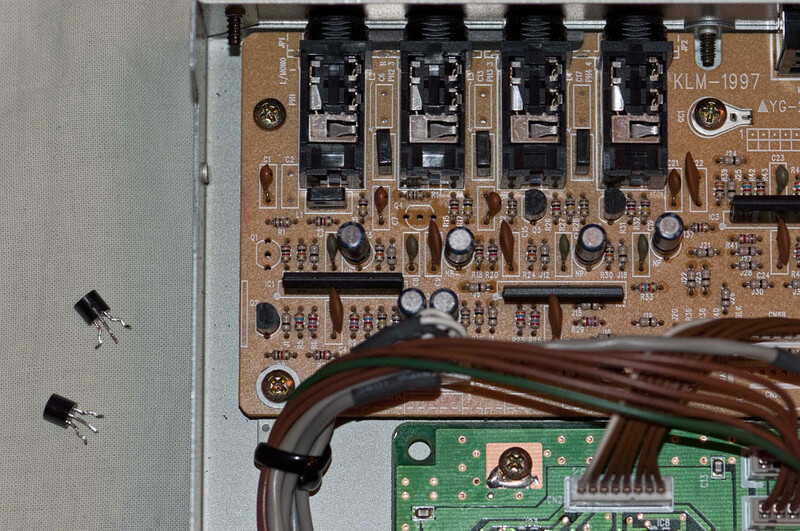 It also has double amount of sound banks over a basic Trinity, which implies that it has the PBS-TRI prefitted. You can't however manage the extra samples yourself but it has factory installed additional 40 multisamples and 200 drumsamples. In my opinion some of the new multisamples are a bit of waste of space, but there are a few nice ones too. Main improvement here is the large amount of good drum samples. 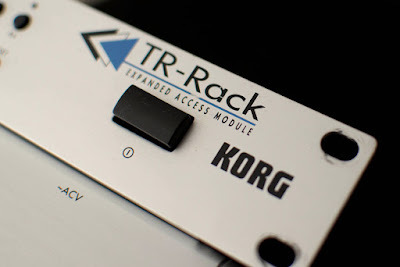 You can't really program the sounds from TR-Rack's own interface and a software sound editor is needed for that. 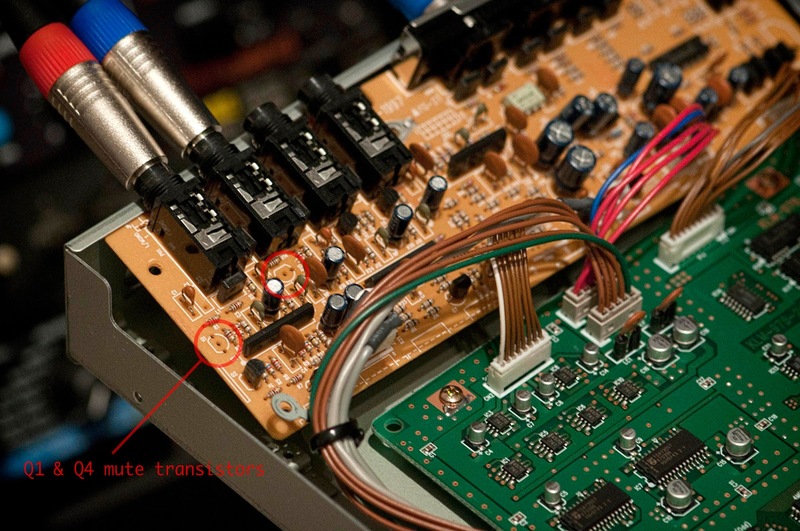 The distorted output was cured by removing these mute transistors.